Since I work week nights, I don’t get to go to any more weeknight Dodger games. Instead, I go on day games during the week and games on Saturdays. In less than twelve hours, I will be attending my first game of the year. One of the things I look forward to is seeing all my Dodger friends and the employees. Sadly, while I was at work, I received a text from one of my season ticket holder friends bearing bad news. 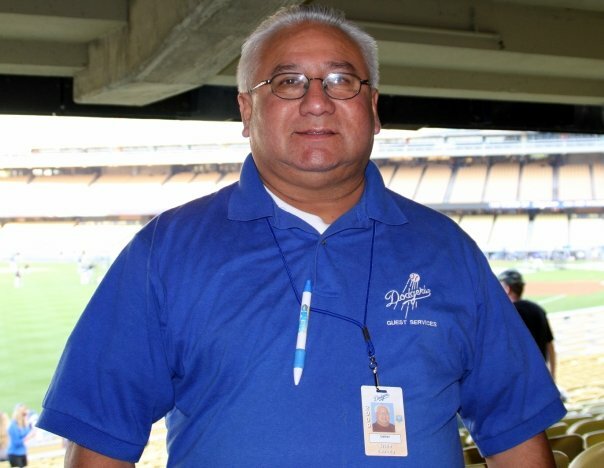 The very first Dodger usher who befriended me passed away this offseason. The first time I met him, my friend Cat gave me her seat since she got a ticket in the baseline section. She told Ernie to take good care of me. He came down in between innings as all ushers do. During one of those trips, he brought me some napkins, saying he saw me eating my hot dog with all that ketchup on it. Another fond memory is the night I got hit by a baseball before the game even started. One of the grounds crew guys (who I later befriended) threw a ball into the stands and I didn’t see it coming until it hit me in the mouth. I was making my way up the aisle and Ernie met me halfway. He saw what happened and was coming down to see if I was okay. That’s Ernie. Big heart and a kind, caring person. He always checked on me to see if I was okay whenever I sat in his section.